Kirsten Burgard, program analyst at the Department of Veterans Affairs and co-founder of Drupal4Gov, has spent the last few months helping Data.gov move its content to the latest release of the Drupal content management system. She’s one of the Federal government’s top experts on Drupal and here she shares her expertise. February 28 is her last day with us and we’re sorry to see her go! So, you might be thinking, ‘Drupal, what’s the fuss?’ Well, since I love using straw men to make an argument, let’s just go ahead and burn this one up. Drupal, a content management system, has become widely used in government since early 2009. Recovery.gov (which is no longer a Drupal site) and Recovery.Commerce.gov (from the good people at the Commerce Department) were the first out the gate with Drupal, and then, it’s like the floodgates opened up and we had Drupal just about everywhere in government. Here’s the thing, it’s not just the U.S. government. 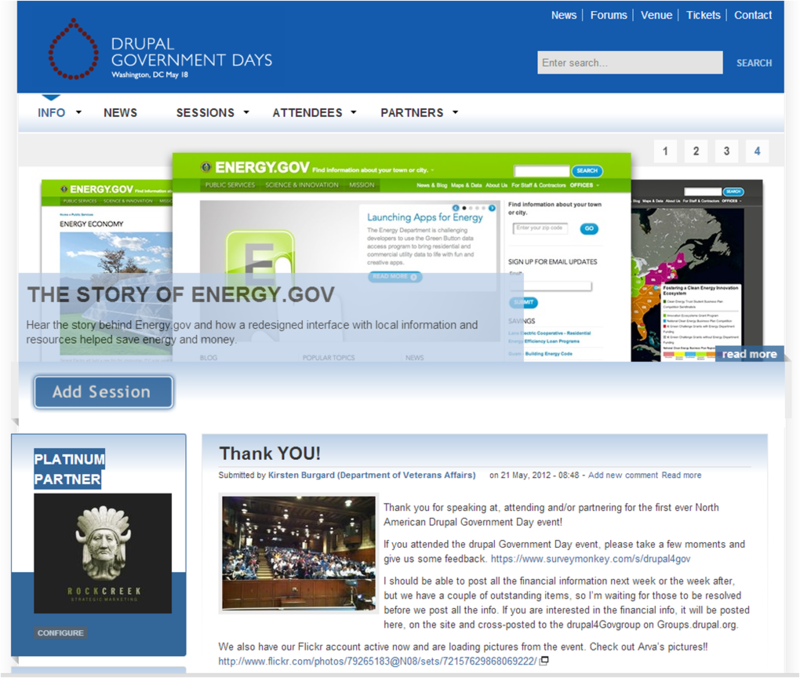 Drupal seems to be catching on as the preferred open source tool for governments worldwide. From the country of Papua New Guinea to the streets of Sao Paulo. This explosion in use has put a strain to the community to provide new, more flexible, faster, and just way more awesome code. Coders are not an infinite resource, and I’m not just talking within government here, but Drupal, too. So, the Drupal community did what any good community would do, we started revitalization efforts. Through local events like Drupalcamp, we get to meet each other to network, solve problems or run code and documentation sprints. We even have way more ambitious projects like the Drupal Ladder Project or the Skill Compass Project, which work to make it easier to learn Drupal best practices and ultimately, to be able to contribute through modules and themes or even through core. We volunteer and work together building community as both government employees and contractors to offer events like the one hosted at the National Institutes of Health on February 21st on Accessibility and Theming where we provided a Drupal ladder sprint to contribute to the Canadian Government’s Web Experience Toolkit — and contributed code! (Watch the event.) Or perhaps a follow-up to the wildly successful Drupal Government Days event hosted at the Department of Commerce last May. We had such a startlingly massive response that we were not able to offer all the sessions submitted, we were forced to cut down on transition times and session times, and we had way too many people for our host facility. I was thrilled with the response and still am, but I have to admit, it was a bit overwhelming for our band of merry volunteers. I’ve been playing in and working with Drupal for several years now. Sadly, though, I am not Certified to Rock, no, really, I’m not. But maybe someday, I will be, until then, I’m going to keep plugging away at building the community. You see, we’ve got this saying in the Drupal community, “Come for the code, stay for the community.” It’s the best, truest thing I can think of to describe Drupalers. I hope, after you’ve poked around a bit, you’ll see the power of the Drupal community. So, take a few minutes and get started with Drupal, I’m positive, you’ll be glad you did. And, if you get stuck, let us know, we’re a community and we’re happy to help! I promise! For more information, watch the on-demand webinar Kirsten participated in and learn more about Drupal and other CMS tools for government. Frankly speaking Drupal is one of the best CMS. I have my own site and i use WordPress, but in near future i am planning to use Drupal. I belive Drupal will be a leader of CMS. And my next internet project compulsory will be used Drupal.